Last week’s New York State Maple Tour wound its way across northern Sullivan and western Ulster counties as 132 registrants got a first-hand glimpse into what our local maple syrup producers are doing to get better. Two busloads of suppliers, producers, researchers and retailers enjoyed what they saw as they spent last Monday and Tuesday learning about the local maple industry. “This is really impressive,” said Mike Farrell, a member of the Maple Research Center at Cornell University in Ithaca. “It’s incredible. “New York state is the best place in the world to make syrup,” he said. “The trees are very healthy, we have the best markets and easy access to many trees. “They have everything going for them,” Farrell said. “This tour shows what should be happening in the Catskills. Maple syrup production is the fastest growing agricultural industry. The tour also stopped at the Time & The Valleys Museum in Grahamsville. Stephanie Caccamo and her husband Steve came down from East Syracuse to join the two-day tour. “It’s so interesting, every saphouse is different,” she said. 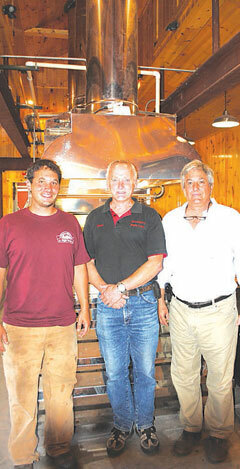 The couple owns Next Generation Maple Products, a full service maple syrup equipment provider. 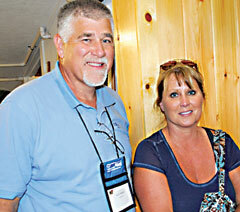 Also on tour was Keith and Jennifer Moore from Louisa, Kentucky. Conversely, the sugarhouse they were visiting, Catskill Mtn. Sugar House, produced 10,000 gallons, as they tapped a record 38,000 trees. The tours included an in-depth look inside each sugarhouse with each maple farmer detailing what makes their facility unique. Glenn Goodrich from Cabot, Vermont was truly impressed. “My family started maple syrup farming in the 1800s in Cabot,” Goodrich, the seventh generation of his family to be in the business, said, “This is an excellent tour. The Gariglianos have done an excellent job here. “They have a state-of-the-art operation,” he said. Coming from a farmer with 50,000 taps over a 45-mile radius it was indeed high praise. 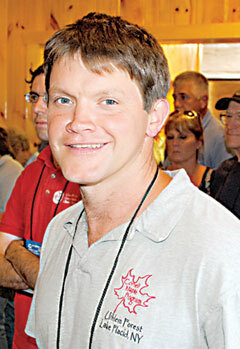 Goodrich, like many farmers in the industry, is only too happy to help his fellow maple syrup producers. “I invented the device on top of the evaporator which boosts efficiency,” Goodrich said. Also on hand to promote local products was Tara Luty of Roscoe Beer Company and April Hodge of Catskill Distillery in Bethel. Helping with the New York State Maple Tour were local maple farmers, from the left: Walter Garigliano, Sean Boyes, John Garigliano and Dawn Boyes. The Gariglianos operate Catskill Mountain Sugar House in Grahamsville while the Boyes tend to Justus Asthalter farm in Parksville. Keith and Jennifer Moore came from Louisa, Kentucky to enjoy the tour. John Garigliano talks with maple farmers about his state-ofthe-art LaPierre evaporator during last weeks maple tour. 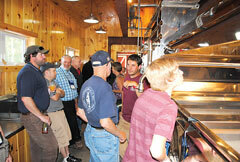 Nearly 120 maple farmers from across the Northeast and beyond were on the two-day tour. Michael Farrell,from the Maple Research Center at Cornell University, enjoy the tour. John and Walter Garigliano, left and right, talk with Glenn Goodrich of Cabot, Vt., a seventh generation maple farmer who helped invent a new and improved evaporator hood which increased the efficiency of boiling sap into maple syrup, thereby saving energy… and money.